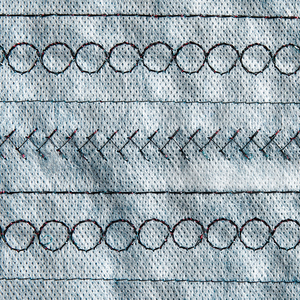 Fabric has the power to make or break a garment. Choosing the right fabric is tough work, and the chaos of enticing, dazzling fabric that greets you upon entering a fabric store can make the task seem daunting, if not completely overwhelming. Hundreds of options contend for a limited amount of needed yardage. And there’s just so much wonderful fabric to wade through and weed out. Where do you start? 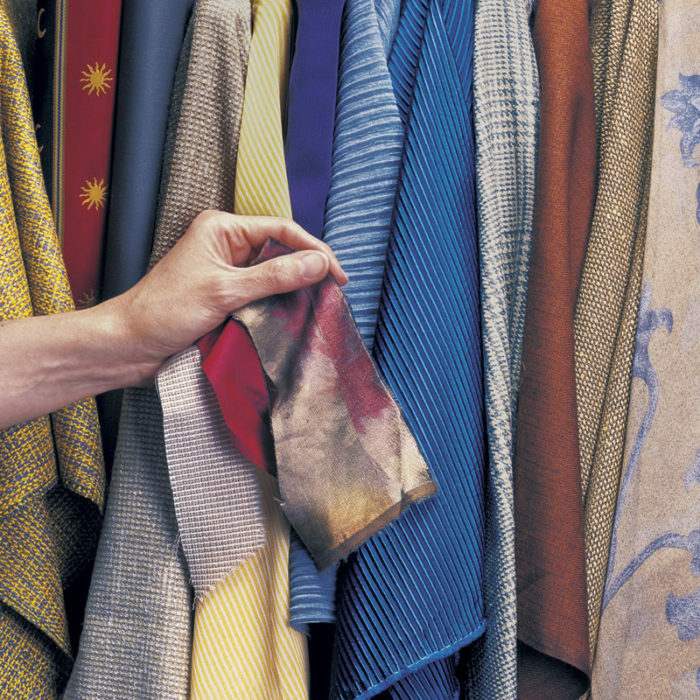 Drag each swatch along bolts of fabric as you wander the store to find companion fabrics; unexpected color combinations will surface, and you’ll find exciting options for ensembles. I used to flounder through the fabric store, more often than not acquiring a fabric that either never got used or was sewn into garments that just didn’t work. Since then, my experience as a professional designer and dressmaker has helped me to learn how to spend my client’s money wisely at the fabric store. Over the years, I’ve developed a system for diving into that sea of fabric and emerging with good, solid selections. 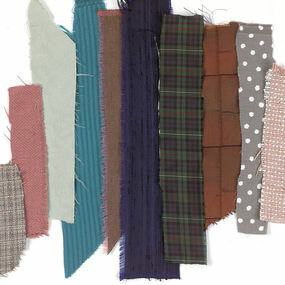 Obtaining swatches of potential fabrics is the core of my method, with a set of guidelines for choosing and using them. I’ve outlined the essentials in this article and hope you’ll try them out. I think you’ll find that making decisions will be easy. My system requires shopping at a store that will cut swatches for you, a service good fabric stores offer. 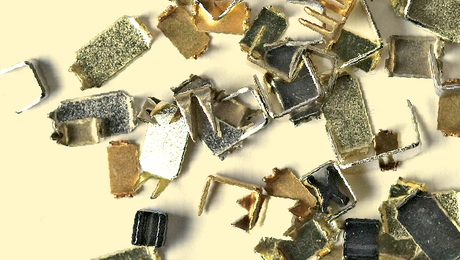 If you are a regular customer, you can ask for the privilege of cutting your own swatches; but, if your request is granted, be sure to ask how swatching is done at that store, and never do it any other way. The advantage of gathering a set of swatches is that you can take the swatches out of the store environment and get to know them better. The disadvantage is that a small piece of fabric may drape or otherwise behave differently than a larger piece. Sometimes it’s worth it to purchase 1/8 yd. of a prospective fabric to carry around with you, or take home to study for a while. 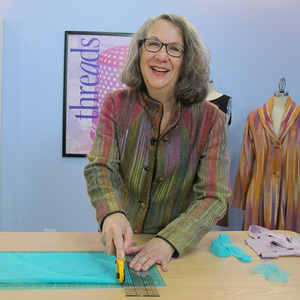 Entering the fabric store with a pattern in hand requires a different strategy than does shopping without a pattern, though some principles from each tactic overlap. 1. Touching fabric is important. First, let your eye draw you to a fabric, then touch it. Even if the fabric appears perfect, if it doesn’t feel wonderful against your skin, rule it out. 2. Be aware of your fabric “mood.” Are you drawn to fabrics that are soft and cuddly, or sleek and sophisticated? Even the season or weather can influence fabric choices. 3. 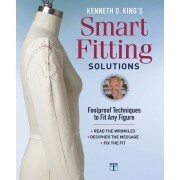 Use an intuitive method to interpret a fabric’s suitability for a garment: Ask the fabric (silently! ), “What do you want to be?” The answer is a blend of information you’ve gathered and your own creativity. 4. 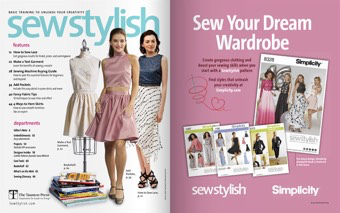 Purchase additional fabric needed to make an ensemble. 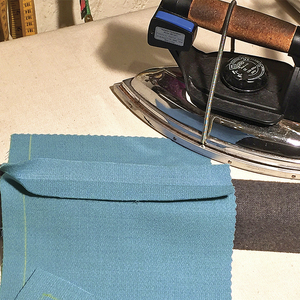 Too often a solitary purchase gathers dust waiting for the right fabric for the pants or top to go with a garment. 5. 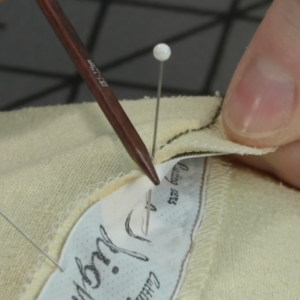 Unroll a length of a potential fabric from the bolt. You’ll be surprised at how different the color will look compared to a small swatch. If possible, take it to a full-length mirror and hold it up around your body. 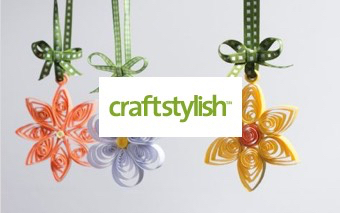 If store lights affect the fabric’s color, purchase 1/8 yd. to analyze at home. 6. When matching fabric brought from home, bring the whole piece of it to the store, not just a scrap. 7. Resist buying a fabric simply because it’s beautiful. What looks gorgeous on the bolt won’t always make a gorgeous garment. If you must own it, think of it as an art acquisition. If you buy 3 yds. 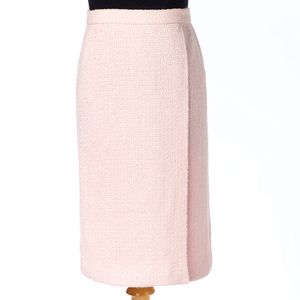 of it, no matter what its width, you’re likely to have enough if you decide to make it into a garment. 8. Know your pocketbook parameters. If you fall in love with an expensive fabric, a small amount could be sewn into a camisole or shell. 9. To gain more knowledge about fabric, visit fabric stores just for fun, with no intention of buying. 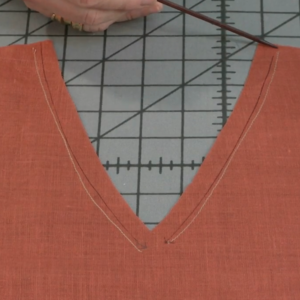 Build a family of swatches that go with a single key fabric. 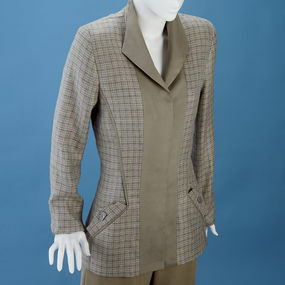 The wool knit print at top right is the foundation fabric for the four “finalists” below it, which were culled from the many “finalists” gathered as possible contenders, seen at bottom left. 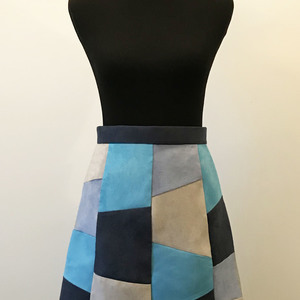 I love it when a particular fabric speaks to me and sparks design ideas, so to create a versatile ensemble without a pattern, say, a jacket and pants, with an alternate skirt and a top or two, I start the process with a fabric that inspires me. Then, with a swatch of it in hand, I build a “family” of swatches that go with the first fabric. • Allow plenty of time for focusing on swatching fabric. 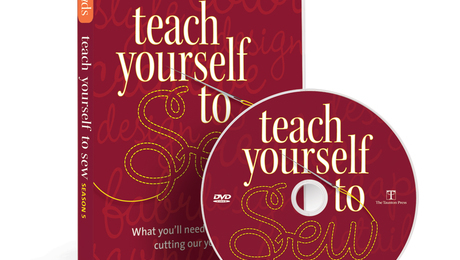 • Don’t be tempted to think about exactly how you’ll use a swatched fabric, or about how much yardage you’ll want. Concentrate only on the fabrics for now and nothing more. • Start your search by strolling around the store. Find a fabric whose color and feel you truly like—if you have doubts, keep walking, but if that fabric sticks in your head, return to it—swatch it, and use it to start building a family. 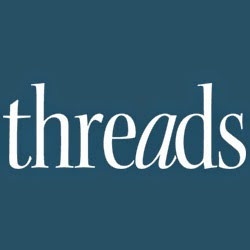 A fabric with many subtle variations of color in its weave is a good choice to build a family around, since your options expand with each additional color of thread in the fabric. • Is the starter swatch compatible with another color? Listen to your gut feelings; a great color combination should make your heart beat a little faster. Monochromatic color schemes (usually my first choice) allow for lots of play with textural relationships. And be flexible about favorite colors; often we go through color periods in our lives and once-loved colors lose their appeal. 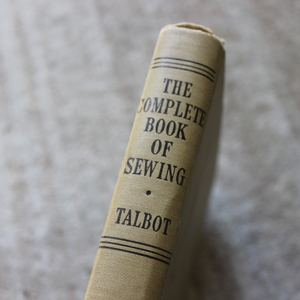 • Examine the fabric’s selvedge and raw edge. 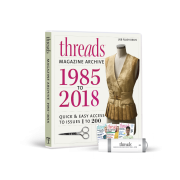 If it has two different thread colors in the weave–and often these are surprisingly different from the resulting color of the fabric itself–those thread colors are likely to work in your family. • Take advantage of bridge colors that can unite two other colors. 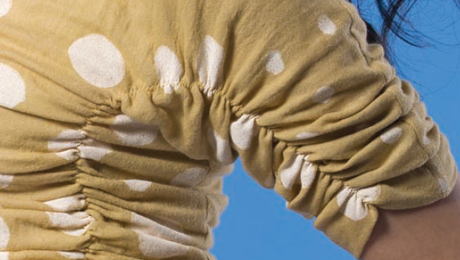 For example, the eye can jump easily between two prints with common elements when bridged by the right color in binding, piping, pieced bands, or details like pocket flaps and collars. 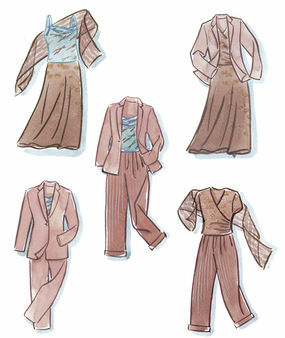 The sketches show how the finalists might be used to make a versatile ensemble. Clockwise from top left: blue chiffon camisole, surplice top and skirt from wool knit print, lacy wool knit shawl, and dull pink gabardine jacket and pants. At center, silk broadcloth pinstripe pants. • After gathering lots of swatches, take them to lunch (I do this when I’ve traveled some distance to the store and want to make purchases on the same day, but you can take your swatches home if you prefer). Spread them out on a white tablecloth under good light and start eliminating. Play with them, interweave and overlay them. Soon the strongest combinations will emerge. Now be ruthless, and get the others out of sight. • The key is to make an ensemble that creates a first impression of, “You look terrific!” The second reaction should be “Great outfit!” Simply put: Your clothes shouldn’t upstage you (a philosophy that was shared by the late and once-renowned designer Valentina). Scrutinize your swatches for those attention grabbers that should be used judiciously, if at all. • When making your final choices, don’t settle for anything less than “terrific.” If a fabric in the group is just “pretty good,” then it’s not good enough. Be ecstatic about your selections. 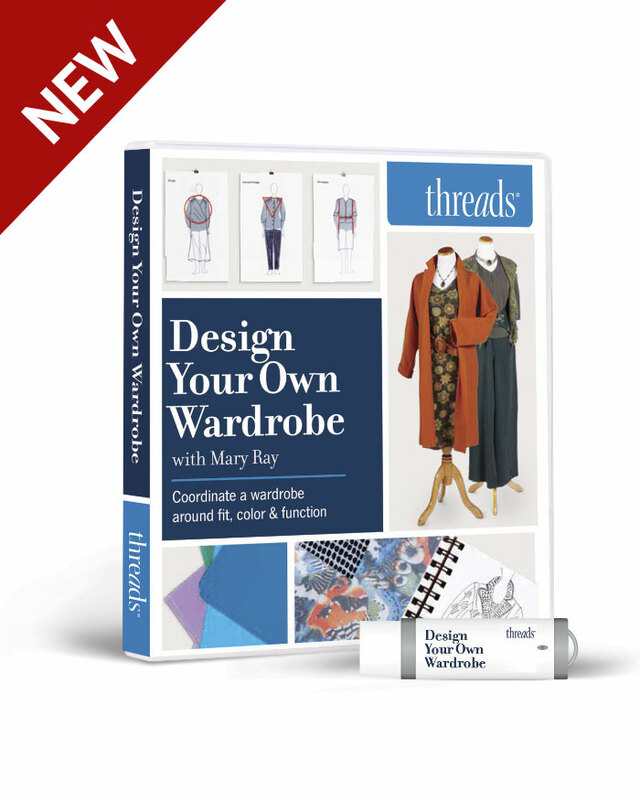 • After you’re done weeding out the swatches so that only wonderful fabric combinations remain, turn your attention to the design of your ensemble. Which fabric goes with what garment? Often your mind has already been working hard on this task subconsciously, and all the details will fall into place. • Analyze the pattern’s style lines on the back of the pattern envelope. Study them to determine characteristics you want in the fabric (see Let the pattern’s style inspire the fabric selection). • Most patterns list suitable fabrics on the envelope. Sometimes these suggestions can be confusing or vague, yet they offer clues to head you in the right direction. • Refer only to the style drawings. Hide the pattern envelope’s photos; they’ll influence you subconsciously. • Evaluate the swatch’s opacity. Hold it up to the light. A swatch that looks dense, even though it feels soft, is likely to have body. • Scrunch some fabric on the bolt with your fist, leaving about 6 in. hanging below. Observe the folds: If the fabric splays out, it has stiffness and body. Closer folds indicate a drapey fabric. Again, a soft fabric can surprise you and have plenty of substance. 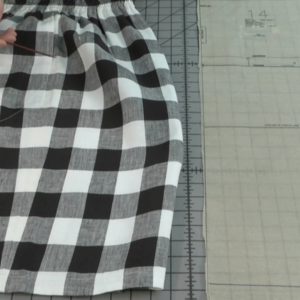 • Fold the fabric to imitate a seam, then finger-press the fold to preview how crisp or soft your seams will be. Make a fold in the fabric again. If it wants to spring back open, you’ll know it has body. • Print and highly textured fabrics affect style lines, often obscuring them. If you want style lines to stand out on a busy fabric, you can insert piping or cording into the seams to accentuate them. 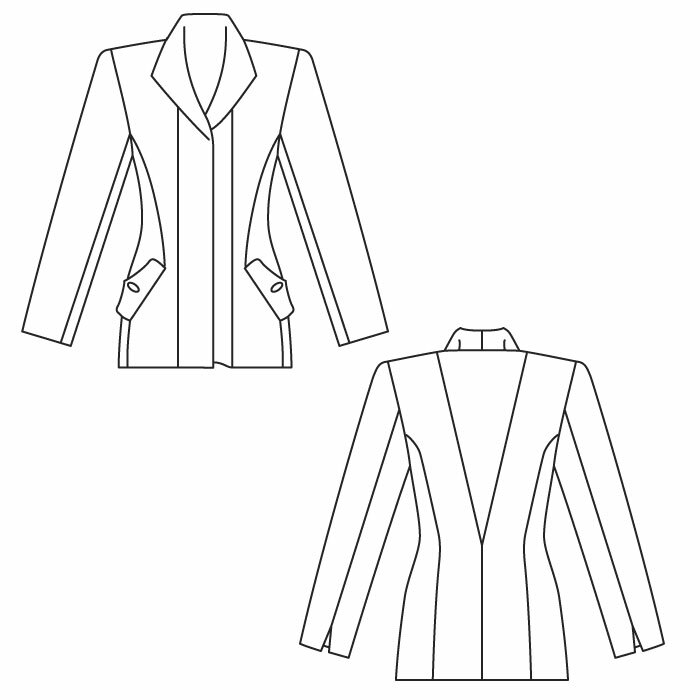 Or make a two-toned garment, and alternate the fabrics where you want the seams to show. 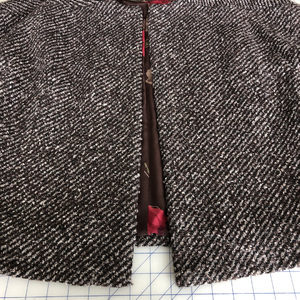 • If you fall in love with fabric that lacks enough body for your pattern, consider underlining, allover-fusing, or a stiffer fabric as lining, to subtly support the outer fabric. 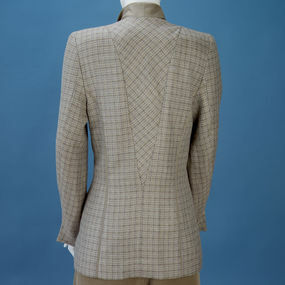 The intricate nuances of fabric are understood best by sewing many garments. I’ll bet there isn’t a sewer in the world who hasn’t made a disappointing garment by using the wrong fabric–and learned from the experience. It all begins at the fabric store, so dive in with confidence and enjoy all those yummy fabrics. 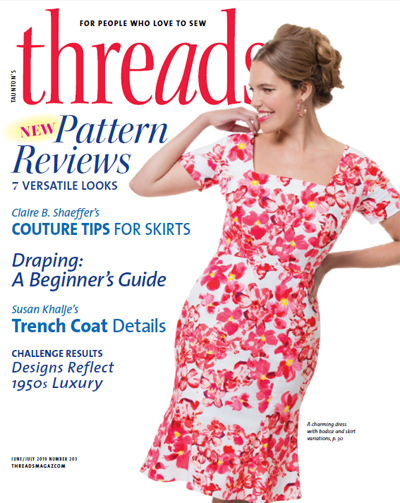 Use the garment’s style lines shown on the pattern envelope’s back to guide fabric selection. These swatches create a soft contrast to the tailored look of the selected jacket pattern (Vogue 2162). 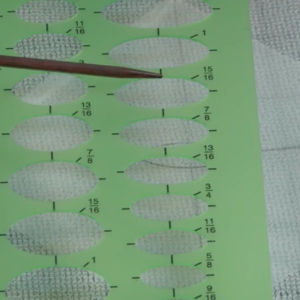 A swatch’s linear elements can change direction within the garment’s shaped panels. Solid swatches invite topstitching to accent the jacket’s seam-lines, and the multi-colored swatches suggest partnerships with other fabrics. 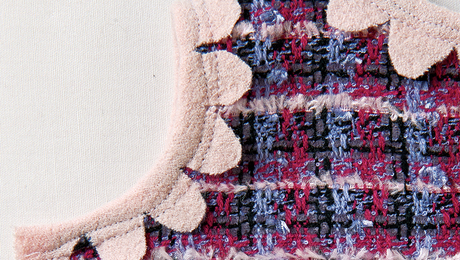 The winner, selected from the swatch competition, is a light-as-air silk/wool blend. 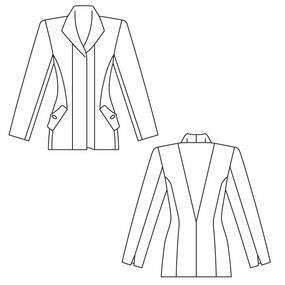 It’s underlined with silk organza, and piping inserted into several seams emphasizes the style lines of this designer jacket. The fabric’s subtle plaid lends itself to cutting sections on the bias, and silk crepe de chine makes the ultimate lining fabric. 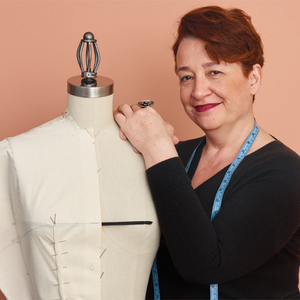 Sarah Veblen is a member of the Association of Sewing and Design Professionals and designs custom garments in Sparks, Maryland.